Advantages: Clear, sharp, colour photographs (mostly), views of normally hidden detail, handy decals in perfect register. Most of us will be familiar with the series of reference book by Kagero of Poland. "Topshots" is a new series, presented in the “Walk Around” style with one page of text briefly describing the subject vehicle and its uses and 43 pages of mainly colour photos showing every nook and cranny of these vehicles. 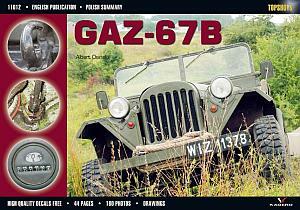 The two books under review tonight cover the Opel Blitz and the GAZ-67B light reconnaissance vehicle. 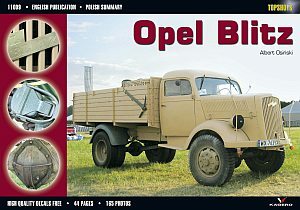 The Blitz, in this instance, is the four wheel drive variety, known as the Opel 3.6-6700 A type (A = Allradentried or All Wheel Drive). This is a fully restored vehicle and where some parts are non-standard, such as indicators and brake lights (for legal reasons), it is noted as such in the captions. On the last page is a Technical Data sheet. The GAZ-67B is a Jeep type vehicle built by the Soviets in 1944 for the Army although the first model, the GAZ-61 entered service in 1938/39. Again, Albert Osinski has done a remarkable job of photographing every aspect of this vehicle plus has presented line drawings of the engine, cooling system, braking system and chassis. The Tech Data sheet this time is on page 37. Techmod decals, also from Poland, are among the very best on the market. In the Blitz book, they offer 16 number plates (front and rear) in 1/35 scale, nine of which are blank along with a host of letters and numbers for the modeler to make his, or her own. For 1/72 scale you get the 16 number plates already made up. Very handy! In the GAZ book, you get 7 sets of markings identical in both scales. Although these books are very interesting, I think the real interest will be in what they come up with next.